At long last, I’m sharing the recipe I’ve probably made the most since Adriana started eating solids (which somehow feels like forever ago and just yesterday at the same time). I’ve had so many requests for this recipe, but never got around to sharing it because it would always be devoured right away, leaving no time for photos. Last week, I finally made it in the morning so I’d have a bit of time to snap a few shots. I use the term “recipe” lightly here because I never measure the ingredients for this pasta; not having to measure anything is part of its beauty and ease. I measured it here so you can get a feel for it, but once you do, I encourage you to throw caution to the wind and wing it! It’s really hard to mess up. You can often find me glugging marinara, spooning hummus, and dumping hemp hearts with abandon into the cooked pasta. The quicker the better, especially when there’s a hangry toddler screaming “Paaaaaaaasta!” at your feet. Not only is this pasta fast and delicious, it packs in tons of protein, fibre, and healthy fats. You can also change it up and customize it so many different ways—I’ve provided a few ideas in the recipe, but I’d love to hear what you come up with, too! I’ve been hesitant to share “toddler-friendly” recipes on here because I’ve learned a few things about feeding a toddler: 1) what they claim to love and hate changes by the day (or minute), 2) toddler likes and dislikes are not one size fits all, and 3) the food my daughter loved at one year old (virtually everything!) is certainly not what she loves at two years old (this age is much more hot and cold, as she loves to assert her independence). It’s not uncommon for me to think I’ve found a foolproof toddler-friendly recipe to share with you, only for it to then be rejected for a month straight. (And I once read that a little one often needs 20 exposures to the same food before they take to it, too.) Luckily, my dear recipe tester, Nicole, runs a daycare and she shares most of my recipes with her daycare children, which gives me a much better idea whether a recipe will be, generally speaking, a winner. I’m happy to say this one was enjoyed! Anyway, I’m sure we’ll have a mix of “my baby/toddler/kid loved this” and “my kiddo only ate one bite” in the comments—that’s just the nature of the beast. (And by “beast” I mean toddler, in a sometimes cute/sometimes scary kinda way…am I right?) But my hope is that some of you will be able to fall back on this recipe as often as we do. I don’t know what I’d do without it as it’s just so easy. Oh, and yes, us adults like it too, so even if you don’t have kids you may want to give it a try on those busy, too-tired-to-cook weeknights. It’s great paired with a simple side salad and Lemon-Tahini Dressing, which can be thrown together while the pasta cooks. I’ve made this pasta countless times for our family; it’s hard to beat how fast and nutritious it is, and it can be changed up so many ways. 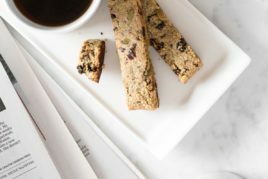 It packs in around 20 grams of protein and 11 grams of fibre per (adult-size) serving (depending on which kind of pasta you use, of course—see my notes), not to mention healthy fats from the hemp hearts. My advice if you’re in a rush is to start heating up the water first, before you gather any other ingredients, as it can take some time for the water to come to a boil. If you happen to have a batch of my Fail-Proof Marinara Sauce from Oh She Glows Every Day (p. 175) on hand, it works wonderfully in this dish. Of course, store-bought marinara works just as well, too. Add water into a large pot and bring to a boil over high heat. While you are waiting for it to boil, gather the rest of the ingredients. Once boiling, reduce the heat to medium, add the pasta, and stir with a wooden spoon. Cook the pasta according to the package directions, stirring every now and then to prevent the pasta sticking. Drain the cooked pasta well and place it back into the pot. Stir in the marinara, hummus, and hemp hearts until combined. Taste and add a bit of salt or other mix-ins if desired. Heat over low until warmed throughout. If serving this pasta to a little one, spread a scoop of pasta out on a plate to gently cool it before serving. Leftovers can be stored in an airtight container in the fridge for a couple days. To reheat, add the pasta into a pot along with a bit of extra marinara sauce (this adds moisture back) and stir to combine. Heat over medium-low heat until warmed throughout. Recipe makes 4 adult-size servings total. * I typically use whole-grain kamut pasta. And sometimes, I mix in a bit of red lentil pasta for a protein boost. Feel free to use any kind of pasta you and your family enjoy! ** To quickly thaw frozen peas, add them to the pot during the last minute or two of cooking the pasta. *** When I have time, I love to steam or boil carrots (or cauliflower) and then purée them until smooth. Then I stir the puréed veggies directly into the pasta. It’s an easy way to add even more nutrition without impacting the flavour too much. This pasta goes lovely with a simple side salad and garlic bread. If your little one isn't a salad fan, try giving them small lettuce leaves for dipping into the dressing. Last but not least, be sure to follow me on Instagram if you aren’t already! I have an exciting Vitamix and OSG cookbook giveaway coming up! Hummus in pasta sounds interestingly delicious. I’ve had hummus on a lot of things, but not on pasta. I agree, it’s kinda weird, right?! My daughter is a huge hummus fan, so one day I was just like…why not? heh. It makes it so creamy. It definitely is yummy on pasta. Gives it a creamy texture and flavour! I do similar with white beans (purée or mash them) as they are soooo nutritious and makes tomato sauce milder to kids taste buds. Can add them even to smoothies. This recipe is so flavourful and quick to make…I love love love the way the hummus cuts through any acidity in the tomato sauce and makes the sauce velvety. I think the hummus might be the secret weapon that makes the children (and me!) fall in love with this dish; it has a “gentle” flavour. Plus, its a great excuse to make or buy some hummus for dipping veggies the next day. Will share this with my bestie who’s got a very hungry toddler :-) Personally I always have cooked Puy lentils in the fridge (I’m French, that’s why) and make a quick “sauce” with those + onion, garlic, miso, bay leaves, red wine and vinegar + lots of pepper. It is super fast to make and my boyfriend loves it too. Thanks for all the inspirations! Oooh, I love hummus, I’ll have to try this! This is totally being made next week! 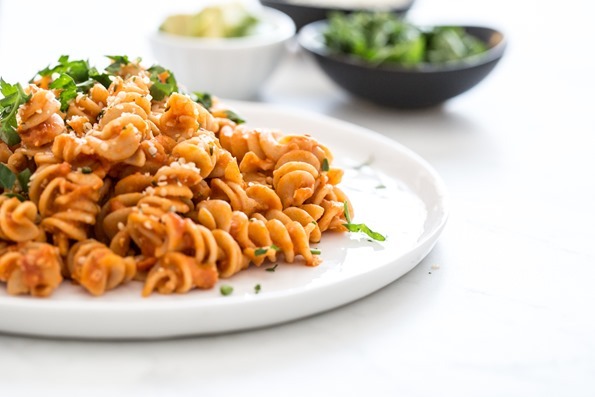 Yum; I don’t have hummus at home, but I have tahini, so I’m thinking I’ll toss that in instead – our whole family loves it in your Fusilli Lentil-Mushroom pasta recipe. 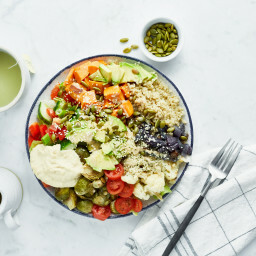 My co-worker is a nutritionist and she raves about that recipe as well – and she, by the way, has guided me through my twins’ food phases: my daughter, who will try anything, and my fairly picky son – they really do come with those inclinations intact! It came out great, and this makes me feel less guilty on “pasta nights,” since I’m still getting some protein into them. Oh my gosh, I was literally just thinking that I have ZERO ideas of what I’ll make for dinner tonight when this post popped into my feed, and I think I have everything at home to make it….so I know what’s for dinner now! Ha! Thanks so much!! Hi Kery, my favourite store-bought marinara is Costco’s White Linen Collection Marinara Sauce. I highly recommend it! As for kamut pasta, I’d say check out the health food/organic section of your grocery store. I use Eden Organic brand and looooove it. Hope this helps! Do you use plain hummus or is there a particular flavored hummus you find works best? 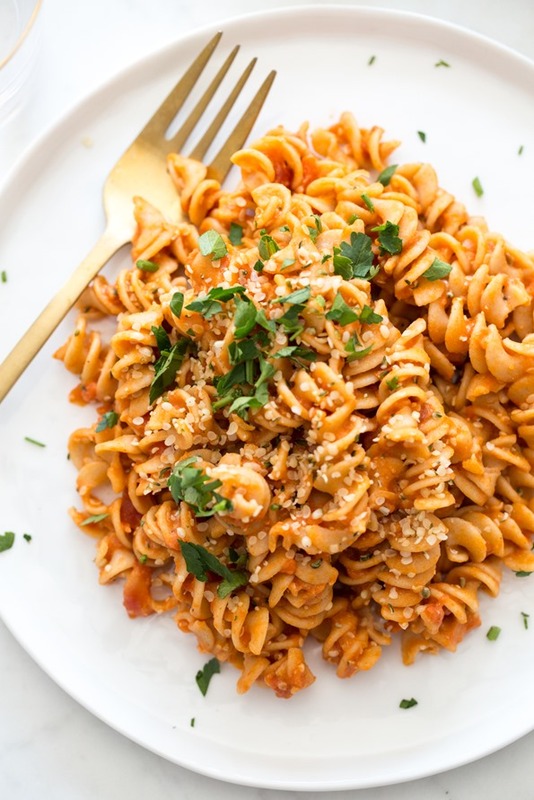 Try roasted red pepper on pasta! It is a favorite in our house! My kids don’t like hummus.. but I’m going to sneak some in the next time I make them pasta to see if they notice since I have some leftover. I thought I was the only one who put hummus in pasta sauce! I find my 2 year old suddenly rejecting lentils in their whole form (just a phase, I hope), so it’s been my go-to along with red lentils, which are pretty much mush anyway and can’t easily be spit out! My fridge freezer has a bin of ready to go soups/sauces, a bin for grains/proteins (also frozen in pucks), and a bin with pre-cooked/cut up/pureed veggies. Meals are SO EASY, especially since our supper is often not on the table until late evening. At least she eats on time! Good luck to all the toddler mamas and papas out there, and thanks again Ange for always inspiring us! Hey Sarah, Oh I LOVE your tips and tricks! I too have tried adding soup into the pasta and find it works great. I’ve never thought of adding frozen cubes though, but I will definitely try this out soon. Your frozen “bin” sounds like a perfect solution. Thanks so much for sharing! This sounds so good and healthy! I would never have thought to add hummus with marinara. I would love to see more toddler recipes! Hope it’s a hit when you give it a try, Christine! We just love the addition of hummus. I’m so happy you enjoyed the casserole, Michele! I hope you love whatever recipe you try from the cookbook next just as much. Enjoy those leftovers! I’m wondering about freezing the sauce in ice cube trays so it’s easy to reheat a few for a toddler sized portion on demand? What I ended up doing was steaming carrots and cauliflower and then pureeing. I also cooked some lentils. I then froze the pureed veggies and cooked lentils in ice cube trays. Today I made the pasta and it was super easy to throw the ice cubes (4 veggie, 2 lentil) into the sauce and heat while the pasta was cooking for added veggie and protein boost. My one year old is on his third helping now and I have to admit I am eating a bowl too and it’s delicious! I’m sorry I haven’t tried freezing this sauce before, but I love the idea! This recipe is amazing! I made it yesterday for dinner for my whole family and they all loved it. It’s my new go to recipe when I’m shot on time. I didn’t have any hummus at home but had canned chickpea, so I was able to make hummus while pasta was cooking. I’m going to prepare several jars of marinara sauce just for this recipe. Thank you so much, Angela, I’ve been following your blog for many years now and you have inspired my whole family to adopt a mostly vegan lifestyle. This recipe is great! I don’t usually eat pasta with marinara because it is too acidic for my tastes, but adding the hummus makes all the difference in the world! I also love the subtle bite of the hemp seeds. 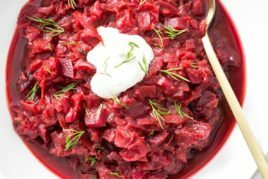 Easy, quick, healthy and delicious – great recipe! Thank you, Angela, for all you do! Can’t wait to make this. I love any kind of spiral style pasta, but you had me sold at 10 minute pasta. Hi Angela, thanks so much for sharing these super tasty, easy ideas to get toddlers to eat healthy! Question for you….what do you think about adding the hummus and hemp seeds to your Easy Tomato Basil Cream Sauce? 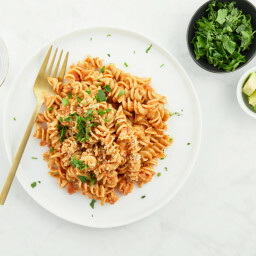 http://ohsheglows.com/2011/05/10/easy-tomato-basil-cream-pasta/ The pureed cauliflower might work as an add-in for that too, no? I think that could be a great twist on the recipe! With the addition of hummus especially, you may find you need to add more water to thin out the sauce a bit. If you experiment, I’d love it if you’d report back with what you tried and how it went. Happy cooking, Danielle! Looks amazing! Also adding some lentil taco meat. Thanks for planning my dinner! Ahhh I can’t wait to try this! Love your recipes – I look forward to trying more! Ok, so I’m scarfing your Nut Free Taco salad from your app as I type, trying not to make a mess of my keyboard. But I had to stop by & say: OMG, it’s soooooo good! :) I’m a Texas girl so I know & love me some taco salads! I’ve tried meat subs before & they’re usually disappointing. But this one blew my mind! I added some black beans & skipped making the dressing since I had a hangry toddler on my hands. I just topped it with a scoop or two of hummus. I also realized mid-prep the only salad greens I had were half wilted spinach & arugula but they worked too. I have so many plans for this…burritos, seven layer dip, the list goes on. Planning on trying this pasta dish on my toddler this week! Thanks for another home run recipe! Thanks for the love, Kelley! So glad you’re enjoying that recipe. Happy cooking! I have two toddlers and can’t wait to try this recipe out for them!! They love pasta (thankfully are good with whole grain), as well as hummus so hoping it goes over well! Now that you have a toddler, have you thought of making a vegan toddler-friendly cookbook? Or do you have any toddler-friendly cookbooks that are your go-to? Thanks!! Hi Marielle, I hope your little ones enjoy it! To be honest the thought of creating a cookbook for little ones is a bit intimidating because toddlers can be SO picky, lol. It’s something I may consider in the future after I have more practice under my belt. ;) I’m sorry I haven’t used any kids cookbooks yet, but maybe someone else can weigh in on a good one! That said, I have a 17-month old toddler who eats everything! I’m not kidding. He eats broccoli, brussel sprouts, spinach, zucchini, rutabaga, all sorts of legumes and pulses and strong flavoured foods like tempeh and fresh herbs all with a huge smile of his face! The trick is: (1) no snacking,except for afternoon tea (2) serve vegetables first at lunch & supper (3) serve each course separately so your child can focus on the food, and (4) model a love of vegetables yourself. I also serve my meals without any distractions, no TV, no radio and no music. Instead, I focus on providing a pleasurable, relaxing time together by dressing the table with fresh flowers and candles, and being organized so that I’m in a calm state, not jumping up and down for stuff, but able to enjoy the joy of eating together with my family. Thanks for the inspiration. I added humus and hemp hearts to the pasta last night and it was delicious. Have shared the recipe with my kids to try on the grandkids – which will be the true test. Not sure my version could be called toddler friendly, as I used my favorite spicy sweet potato hummus, but it sure was delicious. The hummus makes the pasta sauce stick to the noodles. Great for toddlers as they will actually get more of the delicious sauce in their mouths. Oh, that hummus sounds delish, Darlene! I hope your kids have success with the recipe, too. well, sometimes it’s the easiest things that are the best, right? i can see why your toddler would like this pasta the best, sounds lovely! will try soon, sounds good for a lunch at the office cause it can easily be prepared and filled in a container! Thanks for sharing this gem! It was so good and so easy to make (which a student can appreciate hehe :) I really enjoy drowning this with some hot sauce and some butternut squash on top. We (myself, husband and toddler) all loved this. My husband doesn’t always love the idea of meatless meals, but he always goes for it I when I tell him it’s an OSG recipe ? Thank you! If you try it, I hope it’s a hit, Rose! 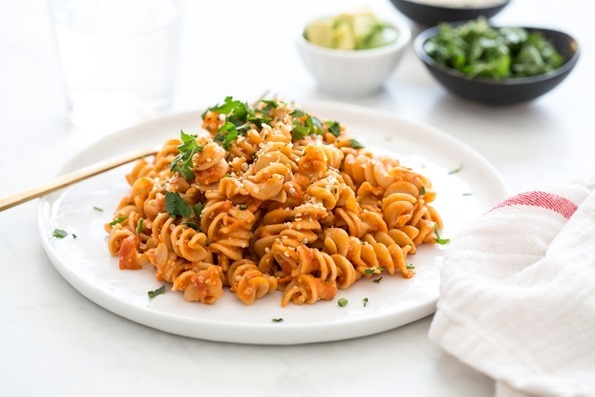 Tried this last night with Trader Joe’s red lentil pasta and it was terrific. The additional protein from the hummus and lentil pasta kept us from looking for a snack later in the evening. I keep the Costco single serving hummus packs in the fridge since they are great for travel (under 3 oz for US carry on requirement) and snacking, so just added one of those when I heated up the sauce. A winner in our house and also a pantry recipe since we usually have everything on hand. this look delish. i can’t wait to try it. thanks for sharing. Probably a little odd but I do love hummus as a creamy sauce base. I think I started using it when trying to make a recipe that called for tahini…haha hummus has tahini right? Looks delicious! This is now one of my go to recipe’s LOVED it!!!! My kids and other family members loves the Pasta so much! Thanks for the recipe. Oh i just forget to mention the [email protected]@. Great presentation i.e. anyone will edger to eat them at a glance. Thank you! I’m so happy the recipe’s a hit. I seem to always have these ingredients on hand. I’ll have to try it. Though my girls are closer to tweens at this point, I am sure they would love it! Hi Angela – Brilliant recipe everyone should do at home. I have visitors today and I shall be cooking this. Wish me luck, though the way you laid out the description makes it so simple. Today lunch is pasta and hummus. Thanks a lot. From the Omigy family. Thanks so much for the reply! I just wanted to clarify your comments. I have both your books (yum!) and in both your pantry sections you mention using natural cocoa powder in your recipes but in your reply you mentioned using Dutch processed. I mostly stick to your savoury recipes but I want to try some of your desserts and just want to make sure I don’t mess them up. ? Will be trying this recipe on the family this week. Angela, please share as many family friendly recipes as possible. As a working mom, who also wants to feed her family real food, I appreciated this post with variations and shortcuts. Not always possible to find the time to cut up and cook multi-step recipes. And over the years, I have found that the less effort I put into supper, the more they love it! 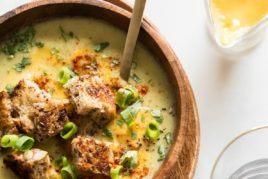 I just wanted to let you know that the link for your Vegan Broccoli and Cheese Soup is down on your website. Was really looking forward to trying that recipe. Thank you, we had some problems with the website but they should be fixed now. Hope you enjoy the recipe! I just discovered this one today and made it tonight for both of my kids (5&7) who loved it! I used my own home-made red-pepper hummus and skipped the hemp seeds. It was definitely a hit and so quick/easy to make that it will likely become a frequent meal for us. Thanks for the great idea! Hi Angela! Long-time fan and first-time poster! I can’t wait to try this recipe. Since you noted the ‘ease’ of preparing this, I was wondering if you have any other thoughts/tips on easy/quick cooking? I recently started reading about the “Instant Pot.” Do you have any thoughts on that? As always, thanks for your wonderful recipes, insights, and stories! Thanks so much! Such a good reminder about the leftovers! My hubby is allergic to cashews, what could I use instead?? Hey Rose-ann, Happily, this particular pasta recipe doesn’t call for any cashews. Did you maybe have another recipe in mind? Please let me know, and I’ll do my best to offer you a substitution, if possible! This looks so yummy. I especially like the toddler friendly… My son has suddenly turned so picky! I’m going to have to try this! I hope it’s a hit with your little guy, Heather! Random question (because I’m obsess with dinnerwave) : what’s the brand of the plate? Loved this pasta! It was incredibly quick and easy and delicious. I’ve never put hummus in pasta, but highly recommend it. My whole family loved this dish. I’m happy it was a hit, Susan! My youngest girl loves chickpeas and I cannot wait to use hummus for pasta. I am 100% confident she ‘ll love it. Hummus = chickpeas, so we are about to taste some of the best pastas in the world. This was so good! I added hemp hearts and cooked some red lentils right along with the pasta, using half kamut and half regular, it was so delicious! Going to try feeding some to my toddler tomorrow. I’m not a fan of tomato based sauces so the hummus made this so much better. I love hummus and so does the kid. Thanks for such an easy toddler friendly recipe Angela! I wasn’t sure about hummus + pasta, but I had some hummus to use up, so I decided to go for it. I’ve liked everything I’ve made from this blog, and this recipe was no exception! I’ll definitely be making it again :) thanks for another great recipe! I will have to try this recipe. I am always looking for healthy kid friendly recipes. My littles are 3, 5, and 7 years old. I also love the tips about adding in puréed veggies. I haven’t tried that before. I was so happy to find a single serving of this in the back of my freezer today! My daughter (18 months) loved it the first time, and again today too! It’s so quick and easy to make. Thanks for the great recipe! Also shouldn’t we wash the pasta under cold running water once after the boil? Hey Richi, Thanks so much for your kind words! I hope you enjoyed this recipe. :) Typically, when serving pasta warm and with sauce, as in this dish, you don’t need to rinse it—just drain. Rinsing is intended to wash off the starchy film that forms on cooked pasta, which is definitely important when making something like a cold pasta salad, so it doesn’t all clump together; but for warm, saucy pasta dishes you actually want that film to stick around (apologies for the accidental pun), as it helps the sauce coat and cling to the pasta. I’m glad to hear you enjoyed the hummus addition, Vincent! We think it adds such a lovely boost to this everyday pasta recipe. Lol, hope you enjoy it! Being a big pasta lover, I decided to follow this recipe. It was really delicious. It was easy and quick. My kids loved it! I love hummus very much, I’ll have to try this! YUM I would have never thought to put hummus in pasta. Needing to try this now. Thanks for the inspiration!! Hope you enjoy it if you decide to give it a try, Nikki! great recipe I love your way of cooking and teaching. I am going to make this recipe for my children and husband. I think the recipe is decent but do not understand this idea of a child choosing to not be eating the food prepared for it. Hi Angela, I agree with the 20 exposures thing as far as kids taking to a food is concerned. But I guess the same can be applied to us adults too because it takes about 21 days for us to form a habit and affinity towards a certain food is no different! The hummus is a nice touch. I love how the vegetable ingredients and being an Indian and a strict vegetarian myself, I am going to try making this for sure! I have not tried humus with pasta before. Fabulously delicious idea! This is such a tremendous twist on a fun recipe. And, I love introducing new foods to the kids. I hope they can travel the world one day and will never be afraid to try new delicacies from other countries. I just wanted to let you know that whenever I meet with someone who is asking for food advice in transitioning to vegetarian or vegan, yours is always the website I give them a link for. I’ve used some of your recipes and they’ve always worked out well so I’m not afraid to recommend you. Congrats on all your success and thanks for the support. I thought this dish was really easy to make and fast. I followed the 2 other reviewers advice and cooked the pasta separately for about 7 minutes, drained almost all of the water, and then added it to my already cooking tomatoes, garlic and onions. I really enjoyed this dish. I made this the other night and it’s my new go-to pasta! My picky husband, and three-year-old gobbled this up! I love how the hummus makes it creamy without any dairy. I am not able to have dairy or turkey/pork/soy, so when I found your blog and cookbooks I was so happy! I just purchased your second cook book and spent the weekend reading each recipe…the recipes and pictures are just beautiful. I am so excited to begin my health journey alongside you! The best part…you’re an Ontarian to boot! :) Thank you for sharing your passion with us! Thanks for the support for Oh She Glows Every Day, Cheryl! I’m so thrilled to hear you’re enjoying it so far (as well as that this pasta was a hit with everyone). Thank YOU for leaving such a lovely comment! 10 minute pasta is very quick indeed and my toddler did like it. Wow! That looks really tasty and seems so easy to make. I’m newly vegan, so I’m trying to find more recipes that are plant-based and quick to prepare. Love your site! Soooo simple and so yummy. I know you have the spinach listed as an optional add-in but it really takes it to another level! Great recipe I love the way you teach & cook. I am surely gonna try this weekend for my children and husband. Am interested in learning to cook more vegan. Looks great and I think my kids would love it! Thanks for the idea! Well, I don’t know about toddlers, but my extremely picky one year old sure liked this pasta. Thank you! OMG I’ve been doing this forever now and had now idea it was even a thing! I have two noodle addicted kiddos and i feel much better about it when tossing in the hummus! The tolerant lentil noodles have been a life saver too! I think my little ones would like this too. Pasta has always been a favorite for me and my children love it too. I like the idea of putting hummus in this recipe. Great addition. I can’t wait to try making it. Thanks for sharing. If you decide to give a try, I hope it’s a hit with everyone, Edwina! I love hummus very much, I will have to try this recipe. I am always looking for healthy kid friendly recipes. My sister’s daughter is so very picky about what to eat so I am helping my sister to have some toddler-friendly recipes. Oh wow, I was just looking ‘Pasta for kids’ and found your blog. This is really helpful so I will cook this for my niece hoping she will like it. I hope it’s a winner, Taylor! Super easy recipe and yummy one too. I can make this and pack in kids tiffin. You may be too busy for this now, but I would love if you could write a post about how you started your babies going vegan. My son is just a little younger than yours, at seven months, and I keep postponing starting solids almost paralyzed with fear of not knowing what to do! I know they just recommend white rice cereal and pretty soon cows milk. But I don’t want to do that. I do plan to breast-feeding to a year, I know that’s his main nutrition, but I think I might start drying up probably sooner than I’d like judging by a drop in supply now. Anyway, if you do have time, or if you already wrote some posts that you could direct me too, I would appreciate it. I did make this pasta for my husband and I, and it was good :-) but I’m guess I’m talking a little more basic baby stuff first. Thanks!! Hi – the book I used to start cooking for my babies when they were interested in more than breastmilk is Super Baby Food. There are some non-vegan recipes but the majority of it has nutritionally dense food for babies that doesn’t include rice cereal or cow’s milk. I loved the book! Good luck! Fabulous recipe. I love the protein boost the hummus gives it. I never considered adding hummus to pasta. Thank you a million times over for this recipe! We’ve recently changed to a plant-based diet in our house and have been looking for toddler-friendly meal ideas. My 11 month old twins both go nuts over this one. It’s a hit in our house. Oh, I’m so happy to hear they love it! Thanks for this recipe. Perfect for weekday nights after a long day at work and too tired to prepare anything complicated. Looks delicious even for the non-toddler :). I’m definitely going to try this one out. 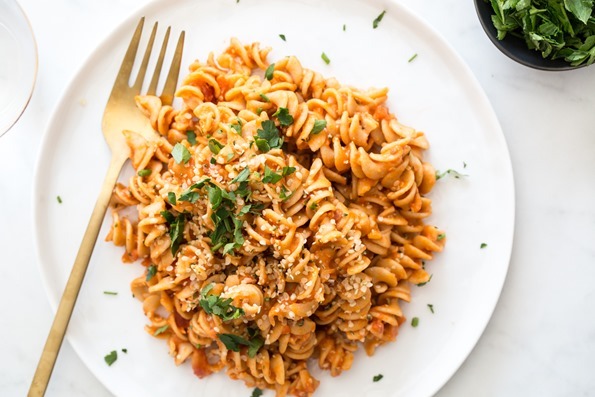 For anyone that can’t have tomatoes or sauce, there is one you can buy it is called nomato, I used it for this recipe and it was super great, made it for a friend who has so many food sensitivities it is hard to find him a meal he can eat. This pasta with a small sub for the sauce was perfect thank you. Thank you! I consider my 2 year old to be a picky eater and I was weary about cooking vegan for the family but your recipe made us a successful dinner. Everyone ate the whole thing and I got many compliments from my husband. Thank you! Oh, that’s wonderful to hear, Evelyn! So glad the recipe won everyone over. Thank you so much for this recipe! I am a recent college grad and recently adopting a vegan lifestyle. I am at home for the summer (before I move out) and want to show my family that vegan meals are delicious! Made it last night with my mom, was a hit and have a ton left over for lunches this week! We blended cauliflower instead of juicing it, which adds a little more texture and actually makes me think I’m eating a cheesy pasta sauce. So good! We also cut up zucchini and cooked it with the sauce! To be honest….not impressed. You say for yourself you use healthier options for pasta…..um ok…you are calling this a vegan pasta…right??? So suggesting any pasta would not consider the recipe vegan when pasta is made with eggs. And frozen peas and cooked cauliflower and carrots??? …there goes the nutrition….sorry but this recipe on scale of 1- 10- would score a low 5 in my tummy..It would be a 10 with all ingredients fresh…you could mince all basil, carrots, garlic, cauliflower, mushrooms too and some olive oil in a blender together and then cook your NON egg pasta, blend and heat your marinara, or OWN fresh sauce and hummus together, then once thats hot, add in your veggies and chopped spinach, it will wilt and be a nice addition…..I just think if you are going to call it vegan make it true and healthy. Why so mean? Honestly, you could have made your point with less hate. Try being kinder. Thanks. Huh? The pasta we have been eating is not made with eggs ..which pasta is made with eggs? And why would you say “there goes the nutrition?” Frozen veggies hold their nutrition better than fresh. This was awesome! I didn’t think I could have a “creamy” pasta once going vegan but the hummus gives the sauce a natural creaminess! I almost think a few olives would have finished it perfectly. Thank you for this quick and easy recipe! So do you make the hummus before you put it in the pasta? If so can you share a good recipe. Hi Rita, I tend to use store-bought lately to save time, but I have a couple great hummus recipes in both of my books if you’d like to try them out. This recipe is unbelievably good. I’m a new plant based diet convert and the creaminess of this pasta really makes a change from the more acidic pasta sauces. The lemon in the hummus brings a bit of a kick to this dish as well. I used pipitas instead of hemp seeds (Australia is pretty slow in the uptake of hemp for human consumption) and it tasted great. Thanks for this fantastic recipe Angela! I am a serious pasta lover, and this recipe looks so simple and delicious! I never thought of using hummus to add creaminess to a recipe before. Great idea, and I can’t wait to try this! Hi Angela – This is delicious as are so many of your lovely recipes. As a new mom, I cannot tell you how much I appreciate an effortless recipe. Would love to see more of your quick at home dinners!! I would never have thought to put hummus in pasta! Loved it though. Creamy, delicious and quick. Added frozen peas (which I add to everything). I omitted the hemp hearts. I hope it was a hit! seeing it,water is coming in my mouth. I’m very excited to make this pasta. i’ll make it tonight and serve my family. i hope they will like it. Yummm!! I JUST LOVE PASTA… mouth-watering Recepi. I love Pasta. It is the most favorite dish of mine and also ready in max 15-20 minutes. It is the best solution if you are really hungry and want to cook something fast. Wooohhh Passstttaaaa… My all-time favorite food. This recipe sounds so good and healthy really! As I am a big Pasta lover, I’ll have to try this recipe asap for sure for my family and friends. Thanks for sharing this awesome recipe with all of us. Best Wishes and Regards. I hope you enjoy it if you try it out Supriya! Heya Angela, Three days back I made this yummy recipe for my house party dear. It was really yummy. Everyone loved it and praised my efforts. Shared your recipe link with them also. Thank you so much once again. Keep sharing new recipes, Angela. Never cooked with hemp hearts before – guess I’ll have to try it! Also, agree with some above that hummus & pasta is a combo I’ve never considered but sounds amaaaazing. Thanks Melanie, I hope you enjoy it if you try it! I’ve made this multiple times already and I love it. It’s so simple and the non-vegan family couldn’t believe how tasty it was! Hey Samantha, That’s great! Thanks for trying it out and letting us know how it went. Made this with Trader Joe’s spinach and chive linguine and arrabiata sauce. It came together in under 10 minutes. Will definitely be making this regularly! Oh that sounds good, Lili! Wish we had TJ’s here in Canada. You’ve done it again. I’m drinking this sauce. So quick/simple/easy/GENIUS!!!! Thank you for making the world taste better. haha love this comment…thank you Lizzy!! My kids loved it!!!! They don’t normally like pasta sauce so I was surprised and pleased. Can I throw in some lentils when I’m cooking the pasta? Hey Lindsay, Oh that’s a fun idea. I think you could if you timed the lentil vs pasta cooking time (so if the lentils needed a longer cook time you may want to throw them in early?). I haven’t tried this before, so I’d love to hear how it goes if you do! Do you think this pasta sauce is freezable?? Hey Amy, Oh good question! I haven’t tried freezing it before, but I’d think it should be fine. My only concern would be the hummus changing texture a bit when thawed, but probably wouldn’t be a big issue. If you try it please let us know how it goes! 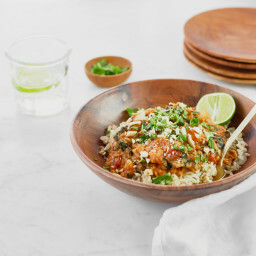 One of my favourite go-to quick dinners. I keep the marinara sauce portioned out in mason jars and frozen. Very satisfying meal. Mind Blowing Recipe. Tried it last weekend & it was just awesome. Thank you so much for sharing this delicious recipe with us. The pasta looks absolutely delicious. Would try mixing a pinch of peri-peri to it. What do you think about it? Hi there! Does this freeze well? Hey Janiece, I haven’t tried freezing the sauce so unfortunately I can’t say for sure. I’d love to hear how it goes if you try though! Adding hummus to pasta was the best advice I have ever read! It’s the only way my 4-year-old will eat beans (she doesn’t know they’re in there). The hummus makes pasta so nice and creamy. This is so amazing thank you for the easy recipe! I am definitely going to be making this at least every week. It seriously tastes great! HEEELLLLLPPPPPP! I love this recipe and so do my toddlers, but I am in need of some serious help. You mentioned in your blog that you have some toddler approved recipes. Please share which ones those would be. I would be so very grateful! What flavor of hummus would you suggest? This recipe is SO GOOD!! I’d love to try adding pureed veggies next time. How much of each kind would you suggest adding? Would any others work, too, in addition to carrots or cauliflower? I love how nutrient-packed this can be made!! Hey Megan, So glad you love it as much as we do!! I would probably start small if adding pureed steamed veggies like cauliflower or carrot…because they thicken it quite a bit. Maybe try 1/2 cup and see what you think & go from there? I’m new to this whole plant-based/ vegan thang, what kind of hemp hearts should I use? 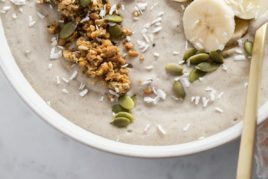 I live in the US, and in my local grocery stores they have shelled/ hulled hemp hearts, would that be okay to use in your recipes? Hey Sarah, Yes those are perfect! Sometimes they are called hemp hearts, shelled hemp seeds, hulled hemp seeds, but they are all the same thing. Just make sure the shell has been removed (I rarely ever see non-shelled hemp in stores). Good luck with your plant-based goals!! Well, this is a favourite of a 50 and 75 year old! We may have the overall mentality of a toddler though. Never would have thought about adding hummus to pasta but it was great! Had also never used hemp hearts and now that I have them, I’m popping them in everything! Gluten free pasta worked just great in this recipe. This just might be one of my favourite comments of all time…lol! Love it. Thanks for letting us know how it went!